Maurice was born April 15, 1922, in Neosho, Mo., to James and Cynthia Campbell. His father was a minister, and the family lived in many nearby towns during his youth. Right out of high school, like many during the 1940's Maurice quickly joined the armed forces to serve in World War II. After the war, he moved to Tulsa, where he worked for Curtiss Candy Company. In the early 1950's he began with Harris-Vogel Tobacco Company in Tulsa. Around 1960, Harris-Vogel sold out and became the R & R Tobacco Company, owned by H.P. Ruble and his son Winston. Maurice started dreaming of someday having his own company. 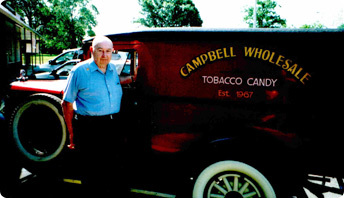 In 1967 he left R & R and started Campbell Wholesale. It was tough working 14 to 16 hours a day out of his new warehouse - his garage. Like now, wholesalers didn't give up business easily, so growth was slow. But with determination and faith, Maurice kept on, hiring one and, years later, another employee. Outgrowing his garage by 1978, he leased a building and started buying direct from manufacturers. In 1984 he was fortunate to purchase his old company, R & R Tobacco, which had become Paramont Distributors, and in 1995 he purchased Noblin Wholesale in Muskogee. In 1998, the AWMA recognized Mr. Campbell for his 50 years in the industry. He was active in daily operations of Campbell Wholesale Co. until he passed away on Nov. 23, 2004.